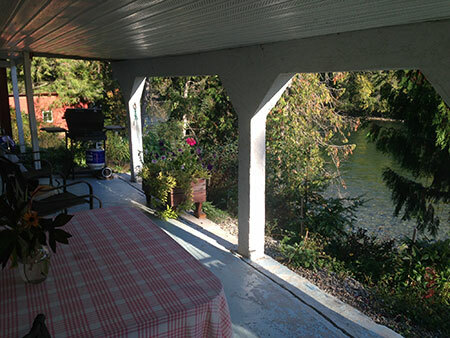 Unique Private Guest House overlooking the Clearwater River with separate entrance, covered deck and very quiet riverside setting. The self contained suite has one bedroom with a Queen size bed and two single beds (bunk bed style) and a pull out Queen size bed (hide-a-bed style) in the living room with a single day bed as well if needed, and one large bathroom (shower/bath). Can comfortably accommodate up to 4 people from the same group. 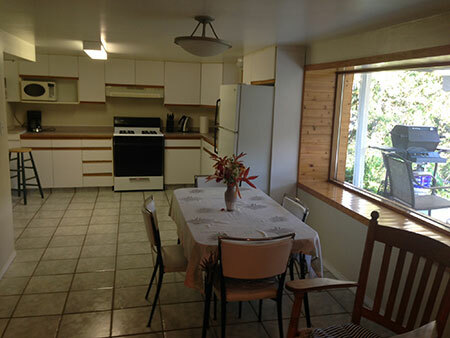 Fully equipped kitchen facility (gas BBQ available) with dinning and living area (Satellite TV/high speed WIFI internet). With the full kitchen, our guests usually prefer fixing their own meals. The supermarket is just a short 2 km drive away from the Guest House, right across from the BC Parks Wells Gray Information Centre. (minimum two night stay in high season). *Please note that Check-In time is after 4 pm and Check-Out is 10 am, thank you. *For advance reservations in high season (July & August), we can only make reservations for two nights as a minimum stay. We can take a credit card number over the email or phone to confirm a reservation. *Special daily, weekly and monthly rates for off season bookings from mid-October 15th to mid-May, call or email us for more details. *Rates are subject to 5% GST, 8% PST and 2% Municipal Tax. We accept: cash, Debit card, VISA, Master Card, American Express, traveler's cheques and e-transfers. Accommodation fees are refundable if reservations are canceled in writing by email at info@riveradventures.ca (or by calling 250 674 0001) up to 16 days before your first scheduled night of arrival (10% administrative fees withheld). If canceled in between 8 and 16 days prior to the date of scheduled arrival 50% will be refunded. No refunds will be given for any reason if canceled within 8 days of your stay or for "no show" upon scheduled arrival date. Riverside Vacation Rentals — Canoe/Kayak rentals and lessons on the Clearwater River in Wells Gray Provincial Park, BC Canada!